Description: 180-gram, 2 vinyl LP set by Pure Pleasure Records! 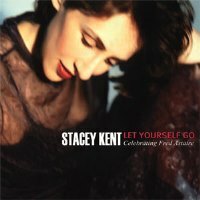 Let Yourself Go is an exceptional collection of 13 tunes written by the cream of popular song writers -- Berlin, Gershwin Brothers, and others -- honoring Fred Astaire's contributions to the vocal art... Kent delivers this selective play list with one of three musical combinations, just piano, with piano plus rhythm, and with a larger aggregation which includes sax and guitar. Irrespective of the instrumental context, all of the tunes are delivered with Stacey's pleasant nasal twang to help her create the impression that the lyrics she's singing are part of an intimate one on one conversation with each listener. There's nothing over dramatic on this album. No gimmicks, just a voice as engaging as any on the scene conveying the meaning of a melody in the tradition of the person she is honoring, the inestimable Astaire. "Relaxed" is as good a word as any to describe the atmosphere for this session... This is another excellent album by American born, U.K.-based singer Stacey Kent, and is happily recommended. Originally released in March 2000 by Candid. This vinyl reissue released by Pure Pleasure Records in the UK in 2013. 4. Isn't This A Lovely Day?